I am writing to urge all supporters of genuine left politics to support and if possible participate in the new Mana Party led by Hone Harawira to found a new movement for radical social change in Aotearoa/New Zealand. The Mana Party is being launched this Saturday, April 30, from 12 noon at the Te Mahurehure Marae, 73 Premier Ave, Point Chevalier, Auckland. This party is a product of the protracted struggle over the last decades to achieve an independent voice for the interests of Maori people in Aotearoa/New Zealand. That struggle exposed a rift that has seen a the Maori Party captured by pro-corporate elite more concerned with protecting the interests of the wealthy against the interests of the vast majority of people in Aotearoa/New Zealand – whether Maori, Pakeha, Pacifica or Asian. The Mana Party is determined to continue to be the voice of the majority of ordinary Maori and at the same time give voice to the excluded majority across our land – whatever their national or ethnic origin. As you can appreciate the new party to be called Mana hasn’t been launched yet and I’m certainly not in a position to make policy on its behalf at this stage. However I can say I have been a proud union member in any job I was employed. The party and I will be pro-worker. I am fortunate having several trade unionists taking leadership roles up to assist the new party and who have offered to contribute to its policy. We have had some policy discussions in the interim working group and can give you a bit of a feel where we are at. Nothing is confirmed of course. • Mana will be anti neo-liberal, against monopoly capitalism and against privatisation of the people’s assets. Utilities such as water, power, roading etc should be in the hands of the people rather than a guaranteed money making venture for corporations. • Our strategy on taxes will be targeted at wealth such as capital gains taxes, death duties, and asset taxes. We will want to abolish GST with sometime like a financial transaction tax (we’d like to call it the Hone Heke Tax). The rich need to pay their fair share. As a start the last tax cut should be cancelled. Labour’s GST cosmetic elimination off fresh veges and fruit says everything about their current state of mind. Timid and uninspiring. 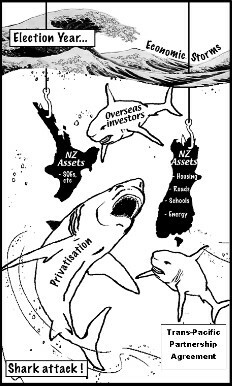 • KiwiSaver is privatisation of our pensions so increasing the money we give to these financial institutions to do what they want needs more thought. • We should nationalise monopolies and duopolies. • We certainly need an agreed mechanism to set minimum terms of pay and conditions for workers. But given the private unionised workforce is small we think we should probably focus on union building first. The two practical steps would be any bargaining unit covering workers would take a vote. If a majority voted in favour of a CEA covering everyone then a bargaining fee would apply for those workers not wishing to join the union. It stops free loading and undermining the negotiations yet still allows workers to choose whether they belong to the union. The second suggestion is that the state covers any CEA costs for both sides. I would appreciate your feedback on this as a short term step. Ultimately every worker needs to be in strong unions but then that’s your job, not mine. 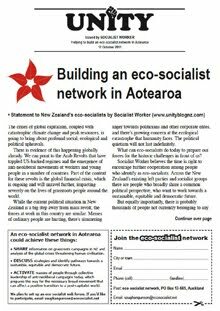 • New Zealand needs a planned economy that makes job creation its main emphasis rather than leaves it to the non-existent free market. Given the short time I’ve had to respond to this I apologise if I haven’t covered everything you’d like. But my response should give you some comfort to where our new party will position itself politically. Have no doubt we will be a staunch party that puts people – Maori and non-maori – before the needs of the already rich. "Happy are those who dream and are prepared to pay the price to make those dreams come true”. By supporting the founding public launch of the Mana Party this Saturday we take one more step towards making our dreams a reality." The two towering world events thus far in 2011 are the Arab revolutionary wave and Japan’s triple calamity (quake, tsunami and nuclear meltdown). My intention is to explore these events in a whole-of-system way, linked into the five terminal crises which are tipping global capitalism towards collapse. 27,000 people were killed in Japan’s megaquake and tsunami of 11 March 2011. Countless others, not just in Japan but across the Northern Hemisphere, are at risk from the spread of contaminated particles from Fukushima’s tsunami-damaged nuclear reactors. It will take a decade to get more clarity on how many are harmed. A freak combo of “natural” disasters is to blame, insist Japanese leaders. Why was a nuclear power plant constructed on the fearsome Ring of Fire, which generates 80% of the world’s major quakes? And why build the plant so close to shore? We can’t be looking at a uniquely Japanese error of judgement, since nearly half of America’s nuclear reactors are sited near major fault lines. And some are a stone’s throw from the ocean. A case in point: San Onofre nuclear plant, near California’s highly volatile San Andreas fault, sits on the beach with just a breakwater as defence against any tsunami. John Key is not working for New Zealand. A new Coalition of community groups, people from religious organisations and unions has been formed. Our slogan is Social Justice (meeting occurred on the 29th March 2011). Our aim is to challenge the policies of John Key and his National led coalition.We believe they are not serving the interests of the majority of New Zealanders. 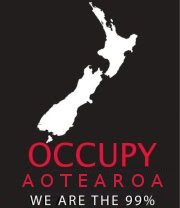 We are organising a MOBILISATION of ordinary Kiwis on SUNDAY 1ST MAY. Also more action when National announces the BUDGET on 19th May 2011. Throughout the world ordinary people are challenging the Free Market prescription from government cuts to privatisation/asset sales. New Zealanders are angry about GST, milk prices and secret Trade deals, cuts to Early Childhood education and privatisation of electricity. Meredydd Barrar, spokesperson says, “Enough is enough. Recent government announcements about cuts and a Budget that will certainly condemn the majority of New Zealanders to relative poverty is not acceptable. Children and struggling families as well as students looking to further their higher education will be penalised”. “There is a latent anger in New Zealand at the moment. We aim to translate it into action. Nationals policies of cut backs and austerity measures will increase the gap between rich and poor which is already the 6th highest in the OECD. We believe this is unacceptable and uncivilised”. “New Zealanders deserve better than an economic philosophy that only seems to make bankers, corporates and speculators richer”. It’s not everyday you hear protesters on Auckland’s Queen Street chanting the words “revolution”. It’s even less likely that the whole crowd will be chanting with the passion and determination that says the revolution is real and right now, not a slogan for the distant future. 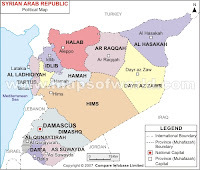 But today in Syria, and across the Arab world, revolutions are under way. And on Sunday 100 people, mostly from Auckland’s Syrian community, turned out to show their solidarity with Syria’s democracy movement. 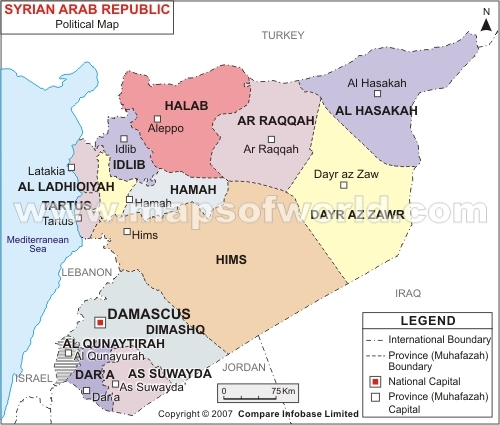 Syria has existed under a “state of emergency” since 1963, when the Baath Party took power. Repression was increased from 1970 when general Hafiz Assad took took power in an internal coup. His son Bashar is now president. This means no free speech, no protests no complaints. Revolts against the current regime in the late ’70s and early ’80s were brutally crushed. In Hama, tens of thousands were killed by government forces in 1982. Such massive repression had an impact on many people’s lives. One Auckland protester, Ali said his grandfather had narrowly escape execution in Hama, while his uncle was later “disappeared” by the regime. Although the family learned he had died in prison there were no official records. In such cases the grief of families is compounded by the fact that wives cannon remarry and property cannon be inherited, because the disappeared are not officially dead. “It is a small problem [compared with the death of that person] but it is also big problem”, Ali said. News of the what happened in Hama was kept secret from the world. Syrians themselves learned of the massacre, but dared not speak openly about it. For 30 years the memory of the revolt and its repression meant most Syrians were too afraid to raise their voices in protest. Now, in the wake of the revolutions in Tunisia and Egyp, things have changed. Even so, the first response to these revolutions was not mass protests. That came only after a group of 10 to 15 year old school children (who were, perhaps too young to be afraid of what had happened 30 years ago,) wrote protest graffiti on the walls of the small city of Daraa. They were arrested and tortured by police. Outraged, their parents protested and others joined in. Even security forces shooting and killing people did not stop the protests, which spread through the country. Amongst the oppression there are positive signs. For repression the government relies mostly on the special forces. Described as “little gods”, because they exploit their position to get anything they want, these men have a stake in defending the regime. The regular army is made up largely of conscripts, the sons, brothers and cousins of those who are protesting. Soldiers have had their cellphones confiscated, to try and cut them off from the people. But in at least one case, regular soldiers moved to protect protesters from the special forces, and were shot at for their trouble. 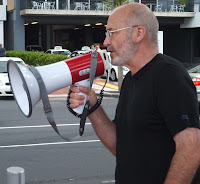 Even in Aotearoa protesters fear that by coming out on the streets they could endanger their families in Syria, but with people back home facing up to the guns of the regime, they feel they must do what they can to let the world know what is happening in Syria. Now example of Hama inspires not just fear, but determination. People know if they do not succeed, the government remains in power, then the lives of everyone who has protested, their friends and their family will be in danger. For more on the Syrian revolt and solidarity events in Auckland, check out Syria Solidarity on Facebook. Left unity in Aotearoa - it’s necessary, and it should be possible. And it’s the title of an open forum at Socialist Worker’s upcoming national conference. We’re inviting all leftists who would like to discuss prospects and strategies for achieving greater left unity in this country, both now and in the future. There’s lots of common ground between outward looking leftists in New Zealand. And there’s growing awareness that the goal of challenging the neo-liberal status quo requires the left to work more closely together. As the crisis points of global capitalism continue to impact on the material and political situation in New Zealand, then so will there be challenges and opportunities for the left. We need to be prepared with realistic strategies and an organisational capacity which will enable us to connect with masses of grassroots people. We hope you can make it to this meeting. 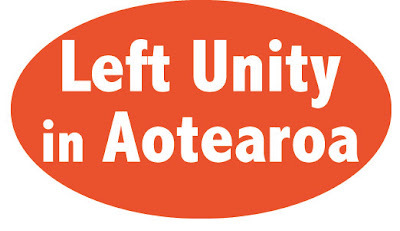 Please bring your ideas on how we can achieve greater left unity in Aotearoa. Everyone will have an opportunity to speak. Please forward this email to your own networks and post on websites. Feudalism, slavery and every previous civilisation in world history had seemed all-powerful to its citizens until a cluster of fatal crises sent the system plunging into a death spiral – and the painful birth of another type of civilisation. So it will be with global capitalism. Today the world system we live under faces certain doom from the uncontrollable intensification and interaction of five terminal crises: • profitability • ecology • resources • imperialism • legitimacy. The future of humanity is at stake. People wishing to influence the future must be able to read the signs in order to design realistic strategies for human survival and social solidarity. 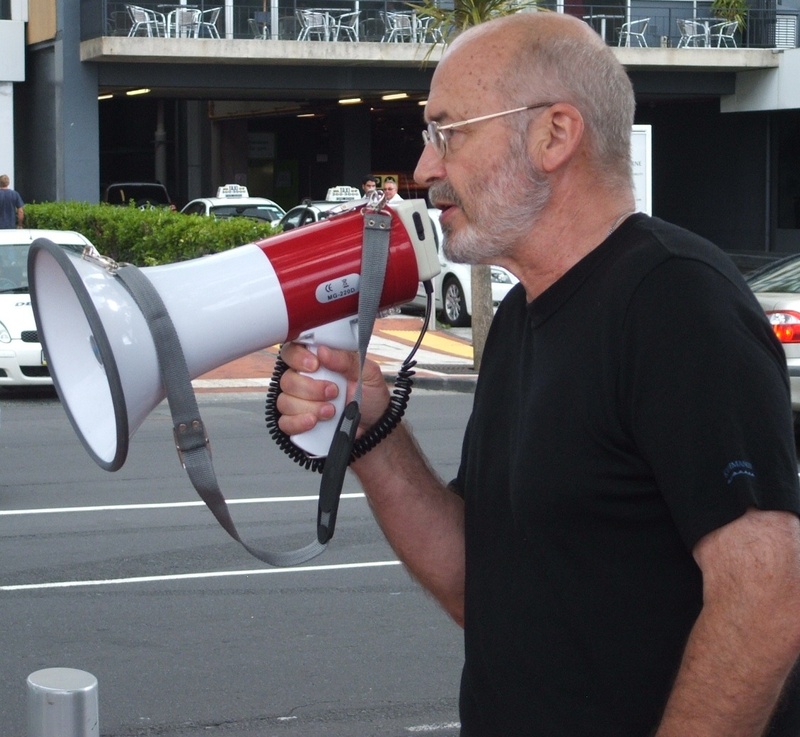 GRANT MORGAN is a longtime ecosocialist in NZ and editor of Arab solidarity website kiaoragaza.net. 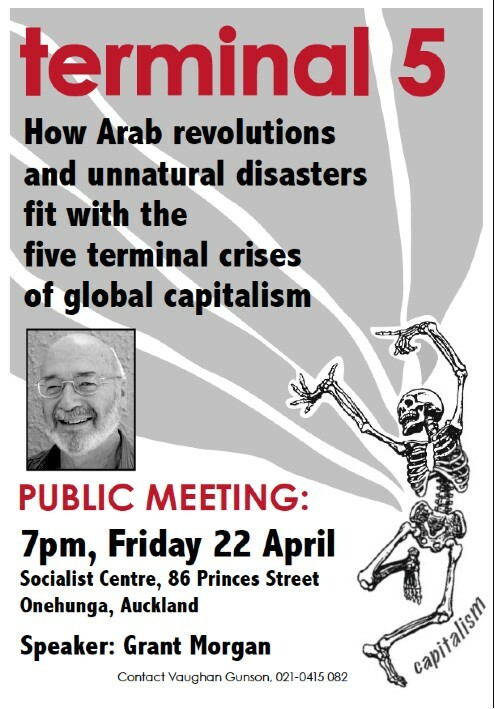 He has been investigating how the five terminal crises of world capitalism link into the wave of Arab democratic revolutions and the terrible tsunami of unnatural disasters (earthquakes triggered by climate change). Grant will be speaking on these era-altering issues. After his talk there will be open floor discussion. You and your family and friends are invited to attend. Tax Justice supports the NZ Not For Sale campaign, which is opposing the National-led government’s behind-the-scenes negotiation of the Trans-Pacific Partnership Agreement (TPPA). “Government decisions that adversely affect the profits of investors from the negotiating countries – Singapore, Chile, Brunei, Australia, Peru, Viet Nam and the United States – could be subject to rulings by international tribunals. That's why the TPPA is such a major threat to the democratic rights of New Zealanders,” says Gunson. Tax Justice is calling for a Financial Transaction Tax to curb the ability of speculators to make tax-free profits from short-term investments in New Zealand financial markets. The tax would also raise significant government revenue. “Following the global financial crisis there’s a need to discourage financial speculation, not further open up the New Zealand economy to financial pariahs, which is what will happen if New Zealand signs-on to the TPPA,” says Gunson. Mr Gunson says momentum is swinging internationally towards a tax on financial transactions that targets the banks, big corporates and the super-rich. In Britain there’s the popular Robin Hood Tax campaign, which is being promoted globally by Oxfam. Earlier this year the European Parliament voted overwhelming in favor of Financial Transaction Tax (see Euro MPs vote for Financial Transaction Tax, 9 March). In October 2009, Brazil introduced a 2% Financial Transaction Tax on trading of the Brazilian dollar, to stop speculators destabilising the currency. 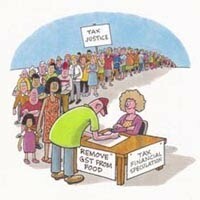 30,000 New Zealanders have so far signed the Tax Justice petition that calls for a tax on financial speculation and GST to be removed from food. The petition will be presented to parliament before this year’s General Election.